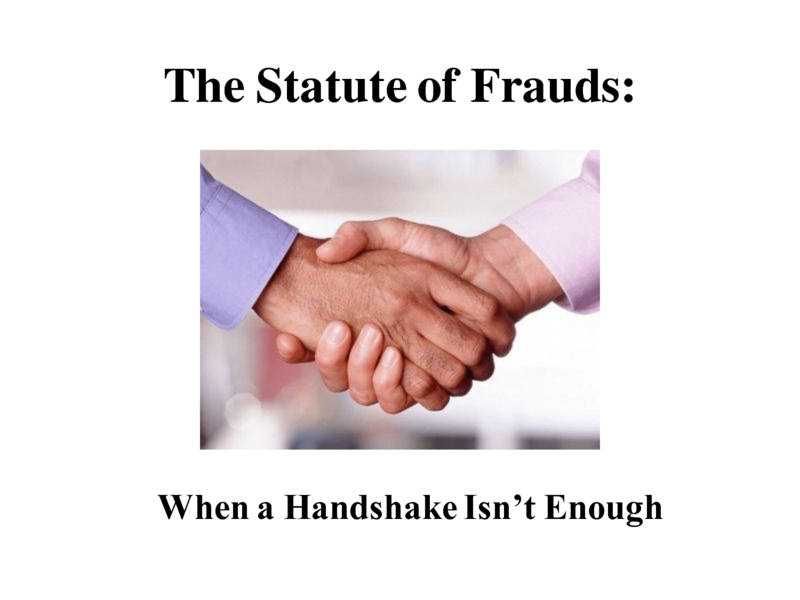 The Statute of Frauds (SOF) requires certain contracts to be in writing to be enforceable. (See earlier post here). 740 ILCS 80/1; 810 ILCS 5/2-201 (UCC analog). The SOF’s “one-year rule” posits that any contract that can’t possibly be performed within the span of one year from the date of making must be in writing. The purpose of the one-year rule is to protect against stale memories and evidence. Typical settings for the one-year rule defense include multi-year leases and “lifetime” employment contracts (i.e., plaintiff sues an employer claiming breach of a promise to employ the plaintiff for life). In Chiappe-Kay v. Barthel, 2013 IL App (2d) 120975-U, the plaintiff sued the defendant after the defendant failed to transfer a Personal Seat License that allowed the defendant (and would now allow the plaintiff) to buy Chicago Bears season tickets for life. The plaintiff sued for specific performance and defendant moved for summary judgment based on the one-year rule: the oral football tickets agreement was defeated because it couldn’t be performed within the space of a year. Siding with the defendant, the Court described the one-year rule’s purpose as barring actions “based upon nothing more than loose verbal statements.” It held that the parties’ agreement couldn’t be performed within the space of a year since the agreement was that the plaintiff would receive season tickets for life based on defendant’s PSL. (¶ 16). The Court also found that the one-year rule barred plaintiff’s claim because the Bears instituted a one-year ban on the transfer of PSLs when the Bears first issued the PSL to the defendant. As a result, there was no way for the defendant to perform – by transferring the PSL – to the plaintiff within a one-year time span. (¶¶ 19-21). Farmers and Merchants v. Hulett, 2012 IL App (3d) 120022-U, involves an oral agreement between a former land trustee and the beneficiary for that beneficiary to rent a house (owned by the land trust) for the beneficiary’s lifetime. When the successor trustee assumed control of the trust, it sent a notice terminating the tenancy and sued to evict the beneficiary tenant. The tenant opposed the eviction suit and argued that he was allowed to live in the house for his lifetime. The Court entered summary judgment for the successor trustee and found that the defendant’s claim to a lifetime tenancy was unenforceable since it wasn’t in writing. The Court noted that the written land trust agreement was silent on the defendant’s right to occupy the house. Because of this, the tenant had, at most, an oral lease agreement with the prior trustee. In Illinois, an oral lease for a period exceeding a year – such as a lifetime lease – is treated as a year-to-year lease. A year-to-year lease can be terminated on a landlord’s sixty-day written notice. 735 ILCS 5/9-205 (year-to-year lease is terminable on 60 days’ notice). The Court found the successor timely terminated the oral lease under the Illinois forcible detainer statute. Hulett also provides good reading on the topics of promissory estoppel (which usually is not an exception to the SOF) and equitable estoppel (which is). (¶¶ 14-15). Promissory estoppel applies where someone takes action in reliance on a verbal promise by the defendant. Equitable estoppel involves some element of calculated misconduct or deception by the defendant.